New vehicle pricing includes all offers and incentives. Price shown includes vehicle MSRP plus any/all options selected or installed, Freight and PDI (amount varies by model: $2095 Metris Vans / $2695 Mercedes-Benz and smart passenger vehicles / $2995 Sprinter Vans / not applicable on demonstrators), Admin ($495), Ontario AC Levy ($100), Ontario Tire Stewardship Levy (amount varies by model $14.20-$17.75), OMVIC transaction fee ($10), wheel locks ($199), Genuine Mercedes-Benz floor mats ($123), full tank of gas. Prices do not include taxes, insurance and license fees. Dealer may sell for less. 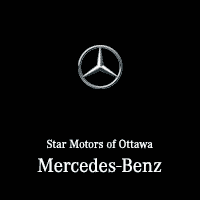 Please contact Star Motors of Ottawa directly for exact pricing details. Note: Vehicle may not be exactly as shown. Some vehicles may be shown with optional equipment or equipment not available in Canada. While great effort is made to ensure the accuracy of the information on this site, errors do occur so please verify information with a customer service rep. This is easily done by calling us at (613) 737-7827 or by visiting us at the dealership.